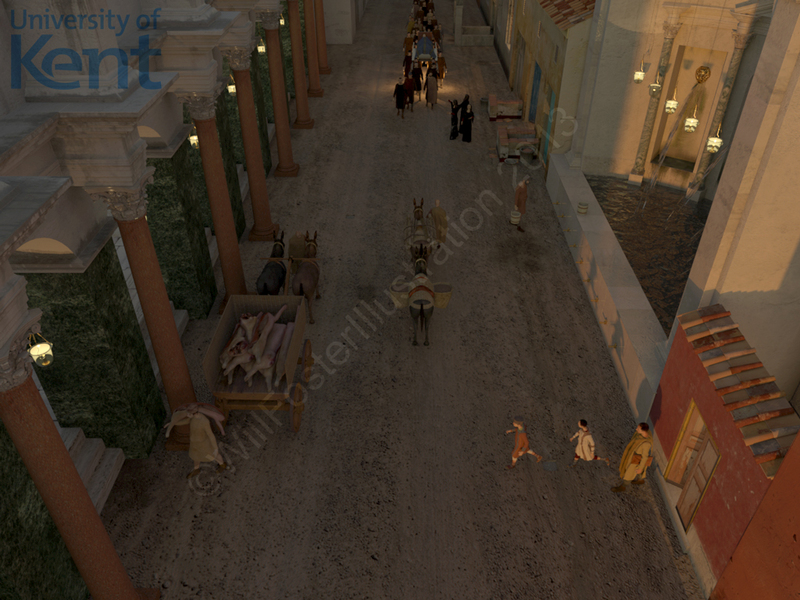 The creation of images reconstructing scenes from late antique urban life is a key component of our Visualisation project. We speak to Will Foster about his work creating the scenes. How did you become involved in historical illustration? My official title is archaeological illustrator, and it’s something I’ve been doing since 1998 when I walked into my local archaeological unit and asked for a job. Traditionally the bread and butter work is preparing plans and sections for reports, artefact illustration and outreach work. It’s the latter that I’ve always enjoyed the most and the one that guides my main avenue of interest now, which is archaeological visualisation. What are the key differences between illustrating modern day scenes and trying to recreate those from the past? One would think that there would be a direct correlation between the passage of time and the information on that period available to an illustrator but that certainly isn’t the case. Taking our present project and the site at Ostia as an example, the Late Antique archaeology has been largely lost in the pursuit by Mussolini of the Imperial Roman remains of the city. Even where one has a ‘modern’ period of interest (as with myself and modern military history) and all the resources available, arguments can still rage over something like the actual camouflage colours of German vehicles during World War Two. So time doesn’t really factor into it too much, the quality of the resource is far more important. What is the practical process that you go through? I work with two main pieces of software. 3DS Max Design and Zbrush. The former is used for the majority of the architectural work that I do. It’s hard to describe the modelling process succinctly. Producing my images is akin to building a set for a film. One does actually setup a camera, lighting and the model or ‘set’ that is ‘rendered’ for the final output. Each model in the scene is made up from polygons; a plane made typically from three or four sides, that allied with other polygons creates a mesh that describes an object’s form. A building can be made up of relatively few polygons whilst a complex organic subject such as a figure can contain thousands, if not millions of polygons. The models are then textured with materials and then rendered. It can all be a long winded process but the results are worth it! What is your favourite part of the illustrative process, and why? Probably the texturing process in 3D modelling. It’s at this stage that I can be more painterly, so taking the facade of a building and working that up in Photoshop, adding layers of dirt, grafitti, and decoration and then seeing that come through in a render. When it works well it’s very satisfying. What interests you in the historical periods you work with? I’ve worked across all periods (and locations) over the years and find everything I do interesting in one way or another, usually because it’s an education for me each time. 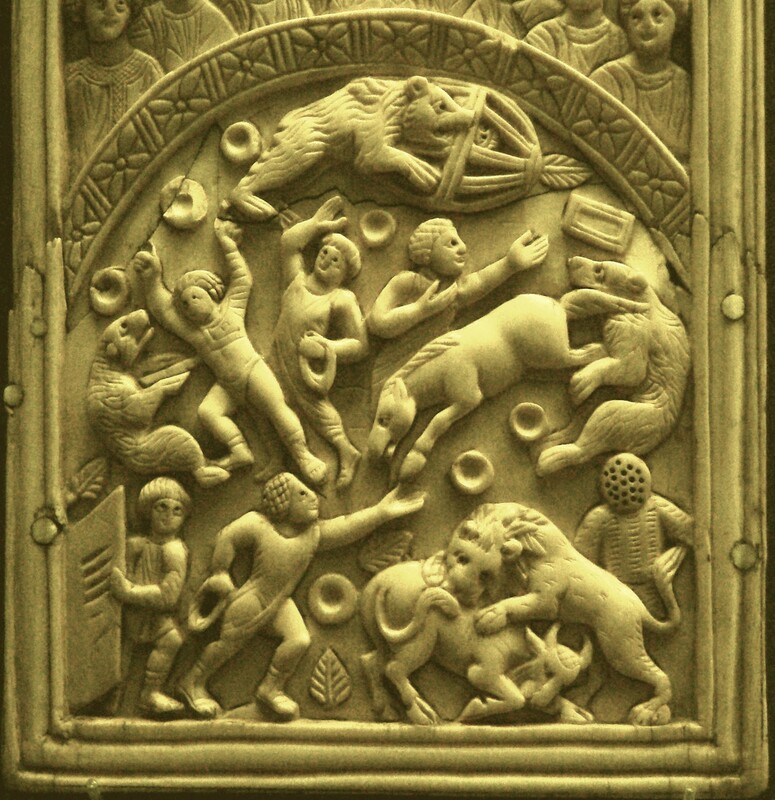 Working on the Visualising the Late Antique City project has been fascinating if only for the giant hamster balls with people inside them being attacked by wild animals that I hope we’ll depict in our theatre/amphitheatre reconstruction! What would be your ideal job to work on? Probably something to do with my own interests, which would be anything to do with Britain’s military heritage. I’m contemplating producing some work based on the Cold War infrastructure of the UK, if I can find the time! Thanks Will! You can check out Will’s website here.